Verizon posts BlackBerry Storm 2 emulator | BlackBerry Blast! 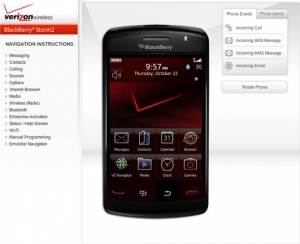 Verizon has a BlackBerry Storm 2 emulator on its web site and it's very cool. Every carrier should do this for their smartphones if you ask us. We were dying to play with the Palm Pre's WebOS before it came out and this would have been a fantastic way to get the feel of the new device. The emulator works surprisingly well, and it seems fast. Verizon hasn't said a word about the Storm 2 despite RIM's official announcement, but if they have the emulator up their going to be offering this thing soon.